Stainless steel countertops are great for prepping food and really easy to clean. Plus they are durable and heat resistant. We came across a really good article from HGTV on stainless steel countertops. This is our overview of the article. Stainless steel countertops are usually custom fit to any area of your kitchen. There are many different finishes from polished to brushed to hammered. Stainless steel countertops can make your kitchen appear larger because of the reflective surface. Pros: The material is durable, long-lasting, eco-friendly, won't fade in color or chip. It won't hold any stains and heat won't damage it. Cons: It will show fingerprints and can be noisy, scratched or dented. It also requires a certain cleaner. If stainless steel doesn't appeal to you, there are other metals available. Other options include copper, pewter, zinc and bronze. Read the full article on HGTV here. Don’t settle for cheap drawer slides. They can be very flimsy and noisy. Don’t choose tile for countertops unless you are willing to often scrub the grout clean. Don’t create a small unusable counter space next to the sink, cook top, or refrigerator. You want a large enough space that can be used properly. Don’t buy a cheap dishwasher. Most likely, it will clean poorly and loudly. Don’t install a backsplash thats made from materials that are hard to clean. Don’t use lights that are too hot under cabinet lights, like halogen. Don’t install a sink that will flex, dent, and scratch easily, like a light-gauge stainless steel sink. Don’t go light on lighting. You don't want a unsafe or dim kitchen. Don't install a floor that requires a lot of upkeep. There is always at least one element that must be included in the design of your kitchen or bath. Decide on an element that would be your wow factor! Check out the list of must haves for your kitchen or bath. Our latest project was a kitchen and bathroom remodel. The home was originally built in 1955, so a complete renovation with new pipes, flooring, appliances, cabinets etc was required. Our client envisioned a modern and sleek bathroom and kitchen. We helped make that vision a reality. Our client created this video below of their remodeled kitchen and bathroom. Upgrade your kitchen and add some color to with a colorful tile backsplash. There’s a wide range of colors to choose from to fit every design your looking for. These photos show modern color schemes and designs. 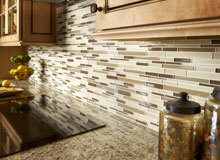 Tile backsplash adds a colorful customized accent to your kitchen and it can be a just the simple remodel you need!